Joseph Stalin was dictator during the handful of years in the 1920s when Soviet revolutionary cinema flourished but as he became convinced that what Sergei Eisenstein, Vsevolod Pudovkin, Dziga Vertov and the others were doing was bourgeoisie and potentially counter-revolutionary he also put a stop to its flourishing. Instead, for close to three decades "socialist realism" was the only kind of cinema that was allowed, from which very little is considered of any value. ”[T]he basic criterion for evaluating the art qualities of a film is the requirement that it be presented in a form which can be understood by the millions” was the stated policy and as conflict was considered counter-revolutionary the films were devoid of that. An additional consequent of Stalin's film policy was that fewer and fewer films were made. But after Stalin's death in 1953 things eased up. Not just for Soviet cinema but for the Soviet Union at large. The horrible years of Stalin's show trials, mass killings, famine and forced starvation (millions of people were killed often for no other reason than that their deaths pleased Stalin) was replaced with the, comparatively speaking, lighter touch of Nikita Khrushchev. Especially after Khrushchev's speech in 1956 denouncing the homicidal madness of Stalin's year. The so-called Thaw appeared, and Soviet cinema was given a chance to expand somewhat. It was still under strict rules, political control and censorship, but it was freer than under Stalin. The Thaw lasted roughly until 1964, when Khrushchev was disposed of and replaced with Leonid Brezhnev. 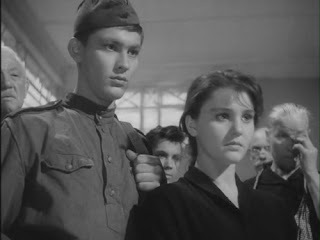 The most significant film of those years was also the film that signalled to the world that a new era had begun, The Cranes Are Flying (Mikhail Kalatozov 1957), which won the Grand Prix in Cannes in 1958. 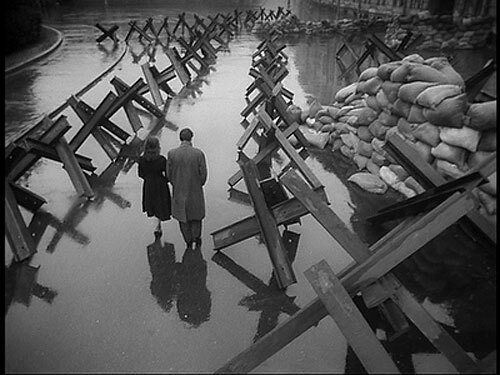 It was a film about the Second World War, as was almost all of the famous films from those years, including Ballad of a Soldier (Grigori Chukhrai 1959), Fate of a Man (Sergei Bondarchuk 1959), Ivan's Childhood (Andrei Tarkovsky 1962) and Father of a Soldier (Revaz Chkheidze 1964). 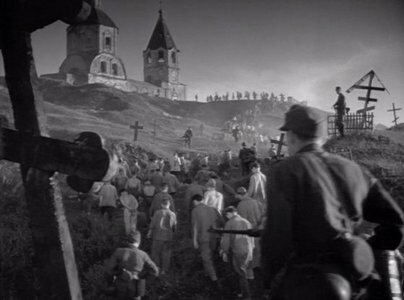 They combine emotionally powerful stories with a poetic sensibility, visually, and are a far cry from the stiffness and stuffiness of Sergei Eisenstein's Alexander Nevsky (1938), the previous Soviet war film of note. Although, despite what Bordwell and Thompson refer to as "mammoth battle sequences" in their Film History: An Introduction, they contain very little actual warfare. They are more concerned with what happens away from the front. The Cranes are Flying is about a happy young couple who are separated when he unexpected enlists and goes off to the front where he is killed. But focus is on her life at home, unwillingly marrying the cousin of her fiancé and living with her in-laws until she finally breaks free. Ballad of a Soldier is about a young radio operator who, after having almost by accident destroyed two German tanks, is given a leave to go home to see his mother. On his way home he meets a young girl and falls in love, as does she, but they have precious little time together. Fate of a Man, perhaps the best of them, is a story of a man's tragic story during the war and in a German prison camp until he adopts a little boy after the armistice. Ivan's Childhood is undoubtedly the most famous one today, because of Tarkovsky, and is about a young boy being used to spy on the Germans and his present situation is peppered with dreams and flashbacks to a happier time before the war. Father of a Soldier finally is about an old man searching for his son and always arriving too late. The son was wounded and hospitalised and that is where the father went first, but the son had been discharged and returned to his unite so the father eventually becomes a soldier at the frontline himself, killing Germans whilst looking for the son. There were not only films about the Second World War that were being made of course. There were adaptations of Shakespeare and Cervantes. There was the musical comedy Carnival Night (1956). (It was produced by Mosfilm, which also produced The Cranes are Flying, Ballad of a Soldier, Fate of a Man and Ivan's Childhood. Father of a Soldier was produced by Grusia Film and Qartuli Pilmi, it is a Georgian production.) The Rumyantsev Case (Iosif Kheifits 1956) was a crime story, Lesson of Life (Yuli Raizman 1955) was about a married couple and their everyday concerns, Amphibian Man (Vladimir Chebotaryov and Gennadi Kazansky 1962) was a science fiction story and the most successful domestic film in Soviet of 1962 (although less popular than The Magnificent Seven (John Sturges 1960)). Elem Klimov, who is today famous for the brutal war film Come and See (1985), began his career making satirical comedies, such as his first feature Welcome, or No Trespassing (1964). But that was towards the very end of the Thaw and things started to become ever more constricted and laborious. Two of the most unique filmmakers who just about managed to get started until the Thaw was over, Andrei Konchalovsky and Sergei Paradjanov, both saw several of their films cut, be censured or banned. But their careers are largely outside the scope of this article. 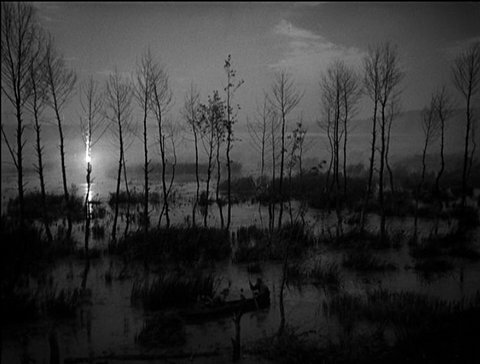 Sergei Bondarchuk and Andrei Tarkovsky continued to do impressive work, including Bondarchuk's epic series based on Lev Tolstoy's War and Peace, but filmmaking would not be the same after 1965. Filmmaking in a time and place of dictatorship is never easy, and making films that did not satisfy the Politburo or the commissariat was not possible in Soviet, not before, after or during the Thaw. Any film made in Soviet needs to be considered with that in mind. But even if there was plenty of restrictions and plenty of propaganda during the years of the Thaw too there was just a little less of it, and it was possible to create something both beautiful and meaningful. I think Marlen Khutsiev is a really underrated director who did major work during this period that has points of contact to the French New Wave and films made by young directors in Eastern Europe in the early '60s. He almost makes Moscow look romantic! Alas I've never seen any of his films. His 2015/2016 retrospectives never came within my reach. But he seems very interesting, and he was the teacher of Abderrahmane Sissako, so I'd better look out for the films again.